We are also working on a single element static wing. I would like it to be ready to be prototyped by the beginning on the new year. The profile was designed by using a a program written by myself in Matlab using the panel method. 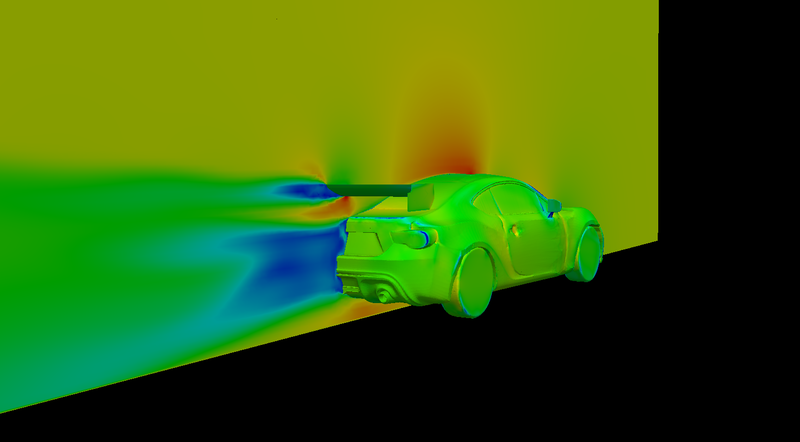 CFD is currently being used to improve endplate design and to find optimum location of the wing on the FRS. Location of the wing will dictate the wing mount design. The blue color under the wing dictates areas of low pressure. Looking at the top side of the wing, red/orange/yellow can be seen. This shows areas of higher pressure. As you can tell, there is more low pressure created than high pressure. The underside of the wing is where the magic happens! This plot shows how the wing reacts to its surrounding. What is the point of designing a great wing but not implement it to its application? This is why we analyze the complete application. This entry was posted in cfd, consulting, design on November 20, 2012 by paulwlucas.